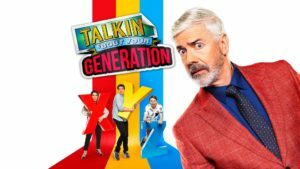 TV Shows – Shaun Micallef Online! During the filming of series 2 of The Ex-PM earlier this year, I had the pleasure of visiting the set and meeting some of the cast. The main filming location was not actually in the Darling Downs, Queensland, but at the former rail workshops in Newport, Victoria. 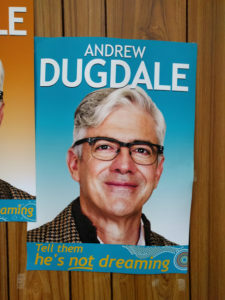 In fact, Dugdale’s campaign head quarters, and all the rooms they use as their offices, were in a former administration building on site, complete in its dilapidated glory. Some of the nearby maintenance sheds were used to build and shoot specific sets, such as the prison sets in the Justice episode. Outside sat Dugdale’s campaign bus, which unfortunately, actually broke down during filming and had to be towed away! The crew were really accommodating and friendly, and I watched as they filmed a scene from “Image”, where the whole cast gathered in Dugdale’s office to talk about his upcoming media appearances while Rita trimmed his nose hairs. It was a complicated shot, and involved six camera angles, which was three different setups using the two cameras in the small room – it was a real room, not just a set! I was also grateful for the opportunity to talk to Shaun, Francis and the one and only John Clarke, who was very giving of his time to talk about social media presence and the future of the ABC. He was ever bit as personable as everyone remembered. If you’re enjoying Series 2, enjoy some of the behind the scenes photos. 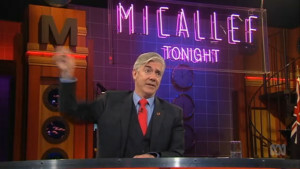 We’re nearly ready for Series 2 of The Ex-PM – it starts this Thursday 8:30pm on the ABC. 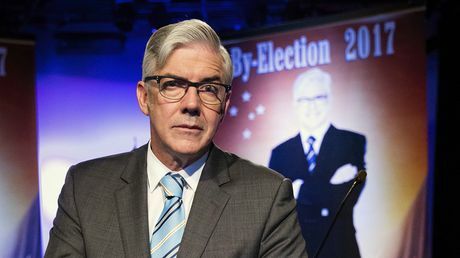 Andrew Dugdale (Shaun), once the longest serving Prime Minister, is returning to politics, and standing for election in the seat of Darling Downs in regional Australia. He’s aided by his wife, daughter, agent, personal assistant, driver, security detail and ghost-writer – so what can go wrong? Dugdale will be back on the hustings, seeking every publicity opportunity he can to get himself back into the public eye. View more on the ABC website. Keep an eye on this website during the series for some behind-the-scenes info on how it was filmed. 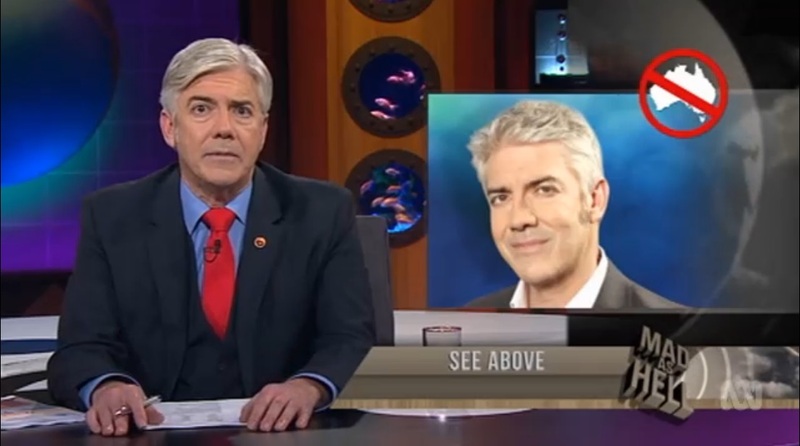 After much anticipation, Shaun’s Stairway to Heaven specials continue this Wednesday on SBS at 8:30pm. 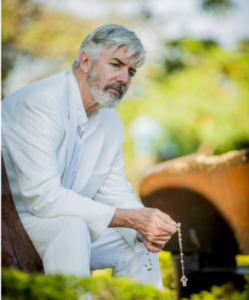 Following on from his singular special in 2014, Shaun is continuing to immerse himself in the lives of those with “unshakable faith” to discover what gives them that faith, and wondering if there is more to life than being a semi-professional writer/comedian. First up, Shaun travels to Salt Lake City to live, eat and pray with the Mormons before heading off with young missionaries to the jungles of the South Pacific. He then ventures to the Deserts of Utah to break bread with breakaway polygamists. 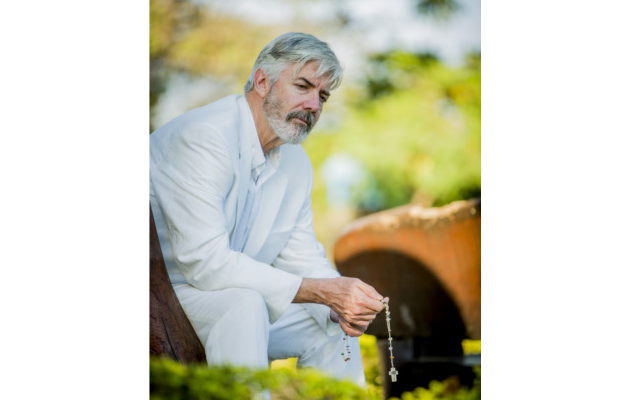 In Faith Healers (January 25th), Shaun immerses himself deep in the back blocks of Brazil, in the community of world famous medium and psychic spirit healer John of God for a chance to commune with the dead. Here Catholicism is intertwined with a belief in supernatural miracles, mediums and the afterlife. Finally, Shaun wonders if Armageddon really is nigh (February 1st) and how to physically and spiritually prepare for the Apocalypse. Heading to America he undergoes biblical combat training with Doomsday Preppers and explores the world of TV evangelism with Born Again Christian fundamentalists. On a pilgrimage to the Holy Land, he stands where Jesus is prophesied to return, before finally retreating to the Greek Island of Patmos where the Book of Revelation was scribed. You can watch the first episode, Gods, Gurus and Ganges, on Vimeo. Thanks to Artemis International for the information. Has this season of Mad As Hell felt more frenetic because of the election which was impending and then imploded? Before we started, we thought this would be an interesting challenge, as we’ve never actually had to make a show during an election campaign; there was the faux election campaign of 2013 which seemed to go on all year. But this one was announced on the Sunday before we went to air. We anticipated there would be a lot more late writing on a Tuesday, but that hasn’t happened, and the election hasn’t altered the way we approach it at all, but it has focused us on more domestic and election topics, so the shows by the nature, when the election’s not on, tend to be about a range of topics. This season seems to be about 60% about the election, each show. I don’t think it’s made any different to way we do it, just the content. Who do you think would be the best Prime Minister for comedy’s sake? I have a suspicion that the next time we see a conservative PM in this country it will be Scott Morrison and he’ll be great. There’s just a confidence and an uncompromising quality about him that would be very valuable to us. I hope Malcolm does well and manages to hold it all together, but I think the next one’s going to be ScoMo. On the Labor side, I hope Bill Shorten stays with us forever, but I’d like to see Tanya Plibersek or it might be Mark Dreyfuss. I think him against ScoMo might be really interesting. Do you feel any obligation to bring out the crowd favourites like the Zinger or the Kraken, or only if the flow feels right? If it feels right. I think we’ve learned that sometimes we write things for characters because we like the character, but we just edit them out, because there’s no reason for the character to be there. The characters are always a delivery system for a joke, rather than the joke in itself. Having said that there we quite a few characters who didn’t have nothing to do with anything tonight. ..to not be there, and leave, yes. Sometimes it’s nice to burn these things to have them and not use, rather than them having nothing to do and having them hang around for too long. What makes you want to perform a character yourself instead of having the ensemble perform it, such as Cardinal Nosey? I get sick of sitting behind the desk, and want to play with the rest of them. [Roz yells] They’re all Rollie! [Replies, with a smile] No they’re not. Roz thinks all the characters I do sound like Rollie, a character I did in the Micallef Program. Bill Duthie is basically Rollie, just basically an idiot. He was an earnest older man, unaware of his surrounds, and Roz has rightly picked me as simply doing that character in a variety of different voices. Sometimes not even that. So speaking of characters, why did you choose The Odd Couple to perform with the MTC? It’s a good play, very good piece of writing. There were three vehicles that I thought would be suitable for Francis and I. One was Sleuth by Antony Shaffer, The Sunshine Boys and The Odd Couple, both by Neil Simon. Amazingly, it was thought we were too young for The Sunshine Boys, so we might do that in a few years, so The Odd Couple was the one we picked. Will this be set in the 60’s as original written? I think 1965 was when it originally went to Broadway, and that’s where we’ll set it. There’s something about no mobile phones, there’s something about the attitude towards marriage and women that is best set in the period, otherwise you have to apologise for it and explain it away. For the casting, you told the audience tonight that weren’t really fussed which role you played and left it up to the director? I was hoping it would be Felix (the tidy one), so I’m pleased about that. I would have been happy to have played Oscar (the messy one), that would have been more of a challenge. 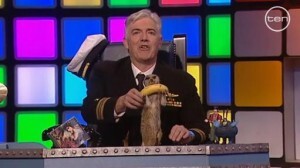 Francis says you’re the neater one, closer to Felix in real life. I think maybe that’s true, but I think Francis could have more easily played both. I think Oscar would have been a bit harder for me, so it’s worked out well. You’ve finished filming the three new Stairway to Heaven specials? Yes, they’ll be on in August. How was it with these compared to the first one-off? Did you go in looking for something different? No it’s the same (quest), because I don’t think I got the answer. I got part of an answer, but I felt less pushed this time, because I had three chances to find the answer. We did get there, we did find out what it was. Luckily in the last episode! Previously we’ve talking about how people all around the world still love Mr and Mrs Murder, and how the dialog between the characters was so natural. We also spoke about how your nickname for Nicola came about but Mike want’s to know about her’s for you, Chaka-khan? I came up with Charlie to call her Fizzy, and Kat came up with Nicole to call him Chaka-khan. I guess that comes from Charlie, and it amused Kat. It just sounded close enough and like a pet name. I remember Kat laughing a lot, we were both amused by the characters. 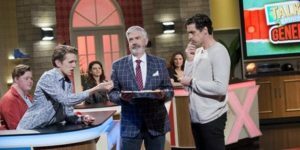 And Mad As Hell is back next year? I’m not sure if I’m meant to announce it, but yes, we’re back mid next-year. I get to say “see you next year” at the end of the last episode, which I can’t usually. Will this be your last season at Gordon Street (which is due to close, and where Shaun has filmed most of his shows)? I think we’re here next year, one more season. Stay tuned for our interview with Francis!